MANILA, Jun 25 2016 (IPS) - Farming and agriculture may not seem cool to young people, but if they can learn the thrill of nurturing plants to produce food, and are provided with their favorite apps and communications software on agriculture, food insecurity will not be an issue, food and agriculture experts said during the Asian Development Bank (ADB)’s Food Security Forum from June 22 to 24 at the ADB headquarters here. The prospect of attracting youth and tapping technology were raised by Hoonae Kim, director for Asia and the Pacific Region of the International Fund for Agricultural Development (IFAD) and Nichola Dyer, program manager of the Global Agriculture and Food Security Program (GAFSP), two of many forum panelists who shared ideas on how to feed 3.74 billion people in the region while taking care of the environment. Dyer also said using technology includes the attendant issues of gathering and using data related to agriculture policies of individual countries, especially those that have recognized the need to lessen harm to the environment while looking for ways to ensure that there is enough food for everyone. 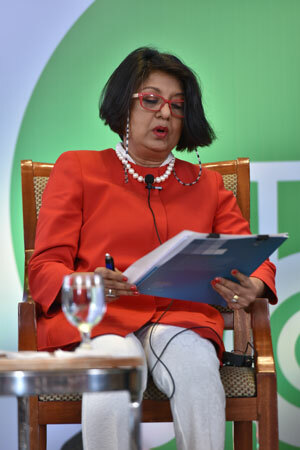 “There is a strong need to support countries that promote climate-smart agriculture, both financially and technically as a way to introduce new technologies,” she said. The UN Economic and Social Commission for Asia and the Pacific estimated in 2014 that the region has 750 million young people aged 15 to 24, comprising 60 percent of the world’s youth. Large proportions live in socially and economically developed areas, with 78 percent of them achieving secondary education and 40 percent reaching tertiary education. A regional paper prepared by the Asian Farmers Association for Sustainable Rural Development (AFA) in 2015, titled “A Viable Future: Attracting the Youth Back to Agriculture,” noted that many young people in Asia choose to migrate to seek better lives and are reluctant to go into farming, as they prefer the cities where life is more convenient. “In the Philippines, most rural families want their children to pursue more gainful jobs in the cities or overseas, as farming is largely associated with poverty,” the paper stated. 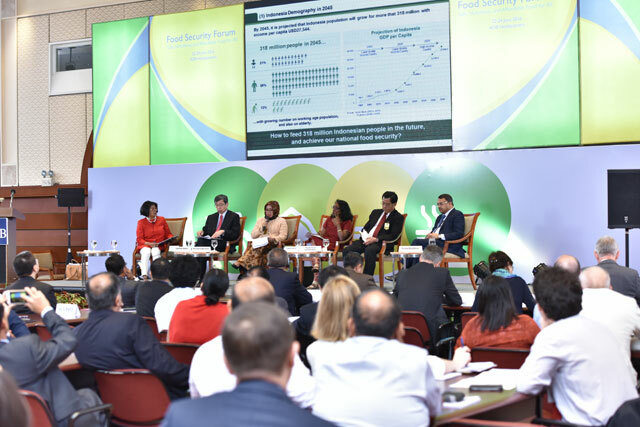 Along with the recognition of the role of young people in agriculture, the forum also resonated with calls to look at the plight of farmers, who are mostly older in age, dwindling in numbers and with little hope of finding their replacement from among the younger generations, even from among their children. Farmers, especially those who do not own land but work only for landowners or are small-scale tillers, also remain one of the most marginalised sectors in every society. The AFA paper noted that lack of youth policies in most countries as detrimental to the engagement of young people. They also have limited role in decision-making processes due to a lack of structured and institutionalized opportunities. Calls for nonstop innovation in communications software development in the field of agriculture, continuing instruction on agriculture and agriculture research to educate young people, improving research and technology development, adopting measures such as ecological agriculture and innovative irrigation and fertilisation techniques were echoed by panelists from agriculture-related organizations and academicians. Professor David Morrison of Murdoch University in Perth, Australia said now is the time to focus on what data and technology can bring to agriculture. “Technology is used to develop data and data is a great way of changing behaviors. Data needs to be analyzed,” he said, adding that political leaders also have to understand data to help them implement evidence-based policies that will benefit farmers and consumers. ADB president Takehiko Nakao said the ADB is heartened to see that “the world is again paying attention to food.” While the institution sees continuing efforts in improving food-related technologies in other fields such as forestry and fisheries, he said it is agriculture that needs urgent improvements, citing such technologies as remote sensing, diversifying fertilisers and using insecticides that are of organic or natural-made substances. 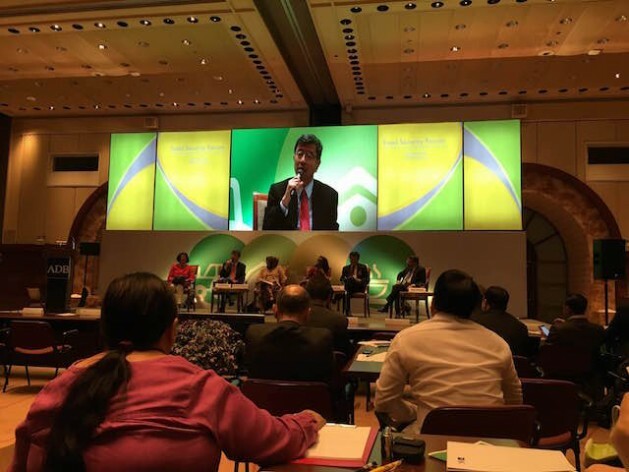 Nakao said the ADB has provided loans and assistance since two years after its establishment in 1966 to the agriculture sector, where 30 percent of loans and grants were given out. The ADB will mark its 50th year of development partnership in the region in December 2016. Headquartered in Manila, it is owned by 67 members—48 from the region. In 2015, ADB assistance totaled 27.2 billion dollars, including cofinancing of 10.7 billion dollars. In its newest partnership is with the International Rice Research Institute (IRRI), which is based in Los Banos, Laguna, Philippines, Nakao and IRRI director general Matthew Morell signed an agreement during the food security forum to promote food security in Asia Pacific by increasing collaboration on disseminating research and other knowledge on the role of advanced agricultural technologies in providing affordable food for all. The partnership agreement will entail the two institutions to undertake annual consultations to review and ensure alignment of ongoing collaborative activities, and to develop a joint work program that will expand the use of climate-smart agriculture and water-saving technologies to increase productivity and boost the resilience of rice cultivation systems, and to minimize the carbon footprint of rice production. The ADB’s earlier agreements on agriculture was with Cambodia in 2013 with a 70-million-dollar climate-smart agriculture initiative called the Climate-Resilient Rice Commercialization Sector Development Program that will include generating seeds that are better adapted to Cambodia’s climate. ADB has committed two billion dollars annually to meet the rising demand for nutritious, safe, and affordable food in Asia and the Pacific, with future support to agriculture and natural resources to emphasize investing in innovative and high-level technologies. By 2025, the institution said Asia Pacific will have a population of 4.4 billion, and with the rest of Asia experiencing unabated rising populations and migration from countryside to urban areas, the trends will also be shifting towards better food and nutritional options while confronting a changing environment of rising temperatures and increasing disasters that are harmful to agricultural yields. 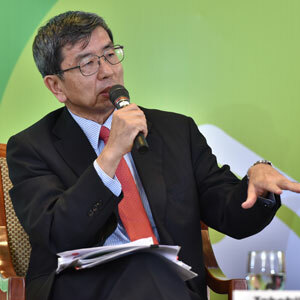 ADB president Nakao said Asia will face climate change and calamity risks in trying to reach the new Sustainable Development Goals. The institution has reported that post-harvest losses have accounted for 30 percent of total harvests in Asia Pacific; 42 percent of fruits and vegetables and up to 30 percent of grains produced across the region are lost between the farm and the market caused by inadequate infrastructure such as roads, water, power, market facilities and transport systems. Gathering about 250 participants from governments and intergovernmental bodies in the region that include multilateral and bilateral development institutions, private firms engaged in the agriculture and food business, research and development centers, think tanks, centers of excellence and civil society and advocacy organizations, the ADB held the food security summit with inclusiveness in mind and future directions from food production to consumption.